Preheat the oven to 400°F. Stretch the pizza dough over a floured surface. Shape out a rectangle about 12x8 inches. Add a uniform layer of ham on the dough. Now add the cheese. Roll up the dough from the long side and apply pressure to seal the dough. Place the roll on greased baking dish. Bake for 30 minutes or until browned. Once ready, let sit for 10 minutes before cutting. Sprinkle with fresh parsley for a better presentation. Serve with mustard if you like. This type of recipe that uses only 3 ingredients and a bit of imagination can give you something completely unexpected. 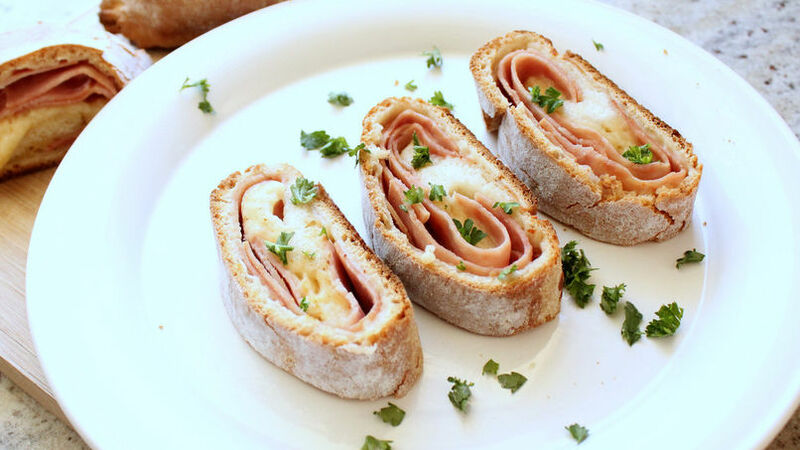 These rolls are super easy to prepare, but are very versatile. They can be served with salads or alone as an appetizer. I prepared them a few weeks ago for a party at my 5-year-old sons school and everyone (kids and adults alike) enjoyed them. I find them to be a fun and unique way of serving sandwiches or pizza. I hope you like it.